Asking "What's the ROI of social media?" is akin to asking "What's the ROI of a telephone?" or "What's the ROI of a computer?" or "What's the ROI of e-mail?" First, these are all tools. They all have the potential to be significant time-suckers. And they each can make us enormously effective. Depending on our purpose and actions with the tools. Second, to truly gauge ROI--on a broad basis--you would have to consider ALL the cost to acquire, set up and maintain each of these over time. You would also have to consider ALL the value attained through the use of the tool over time. To do this properly and completely would be an enormous job, would require some use of metrics, and some use of judgment or anecdotal evidence. Most importantly, this exercise probably isn't necessary or worthwhile in order to determine whether the tool adds more benefit than resources it consumes. At least it hasn't been deemed worthwhile for us to undertake such a task to decide phones, computers, and email are worthwhile, right? Why would social media merit any different treatment? A more realistic and useful approach is to project desired ROI use-by-use or, in marketing terms, initiative-by-initiative. When marketing with the telephone, you can measure the "ROI" (return on investment) of a smile and dial campaign, or you can measure the number of times your phone rings in response to a particular ad campaign. And you usually aspire to tie dollars to either. These are INITIATIVE SPECIFIC examples. An initiative will always have a beginning, a middle, and an end. The ROI question should be tied to an initiative, not a tool. Tie it to how you are using the tool. Social media are a (fluid) set of tools—applications—that facilitate Internet-based relationship development (the “social” part of social media). Social media applications can be extremely effective tools--but having the tool is not enough, it's what you intend to do with the tool that matters. Just "being out there" in social media (without specific objectives) is not actually an initiative--it's an experiment. As such, it cannot be measured or quantified meaningfully. In general, simple metrics like number of followers, fans, or friends, are mostly irrelevant without defined purpose and specific goals. To determine any sort of meaningful "ROI," strategy must exist behind what you do and why. Your desired ROI is then based on each aspect of the strategy, or on a combination of aspects. Again, never on just the tool. Social media is most effective when its use is merely a component of strategies that include some online relationship development. With an Internet-initiated or -enhanced relationship, what you seek to accomplish can range from recruiting to prospect conversion to brand awareness to customer service. Which initiatives you undertake should depend entirely on what (or whom) you're marketing and, much more importantly, who the buyers are. Where are they? And what do those buyers want or need to know in order to decide to buy from you. Measures might be interactions, conversions, salvaged relationships, or sales. Or many other such goals. To determine your ROI, decide whether any particular social media tool coincides with your other marketing, recruiting, and client service initiatives. Then decide if the investments necessary to set-up and maintain your social media presence, as necessary to achieve success with the tools(s) for THAT initiative, is worthwhile relative to the potential (projected) results. Measure against your projection. When people ask, "What's the ROI of social media?" educate them to understand that ROI is more appropriately and meaningfully measured on an initiative-by-initiative basis. If they are already using social media but there are no "initiatives" identified to measure, that's an issue all its own. My purpose in writing this is to shatter the notion that ROI can fairly or reasonably be assessed on a tool without a clear plan for its use. This is an interesting twist, though I still think it's a legitimate question that people ask before they add another stack of things to do to their schedule. Perhaps then the response is 'given a comparable strategy we achieved some such result'. In all you probably can put some dollar amount to the social strategy, but you may not be able to link them directly. Michelle - very interesting analysis (as always). I think what I take away from your discussion is that the better question related to social media is: "Does social media IMPROVE my marketing ROI" (whether for an individual marketing initiative - or across all my marketing initiatives). Clearly, done right social media can (amongst other things) increase awareness, stimulate new conversations and relationships and increase readership/viewership of firm "content". If awareness, relationships and engagement are parts of the firms existing marketing ROI equation they should be able to evaluate the uplift (or otherwise) from social media. Talmadge, it's always a legit Q to ask if something is worth the effort. Especially if it's brand new. The issue here is to clarify that you cannot fairly assess ROI of social media in general, but you can of a particular use or application of social media. Most people jump in without considering their strategy. Many then sour to SM when they simply haven't done their proper pre-work and therefore have unrealistic or misaligned expectations. Paul, thank you! And BINGO! You said that very, very well. Baseline benchmarking and monitoring overall communications and engagement are great ways to track the impacts of using social media tools. And, like a lot of things we do in marketing, it's not always possible to attribute an upswing in activity or engagement to a specific source, so you have to look for "reasonable coincidences." I've been trying to find out if anyone ever looked at the telephone as an "investment." Appreciate your clarity about this common misunderstanding. When I was in "J" school (back it the Stone Age) we were taught a formula in PR with the acronym "RACE", for Research, Action (planning, message crafting), Communication, Evaluation. Too often, users of social media start with the C step and anticipate the E step will be obvious. Not so. The E will only be clear if you have done the research to define the right channels and targets and then intentionally made the plan for using the tool with specific goals and objectives tied to the features of the tool and the outcomes you require. The decision-makers (usually older folks in the firm) may text their kids, but don't see the value for marketing or sales. On the other end of the generational spectrum, the firm's new hires would rather give up coffee than their Facebook account. - If a firm favors newsprint, their clients must be 60'ish without email access. - If a firm favors direct mail, their clients are probably still working, and wearing out their fax machines and printers. - If a firm favors email newsletters, they're living in the 90s. - If all their staff are on LinkedIn and participating in a real time, online conversation...that's a firm of the future, and one many young professionals want to work with. In this competitive economic environment, firms should stop asking "What's the ROI?" and should start asking, "How can we differentiate our firm, and get it out of the pile of the rest of our competitors?" Early adoption of any appropriate technology can get you there. Will, if anyone answers you with info on the telephone thing, please do let me know! I'd be very interested, too. Russell, brilliantly put! 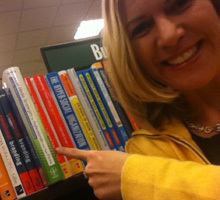 I'd love to reference your comment in my upcoming book on social media (in the ROI section), if you'll permit? With full attribution, of course!